You'll be £28.00 closer to your next £10.00 credit when you purchase Southern Railway, Maunsell Moguls and Tank Locomotive Classes. What's this? 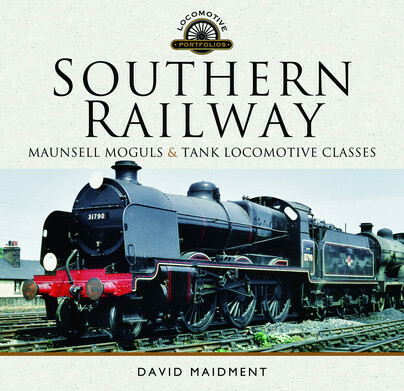 Southern Maunsell Moguls and Tank Engines is a volume in the series of Locomotive Profiles being published by Pen & Sword. It describes the conception, design and construction of the two- and three-cylinder 2-6-0s initially the ‘Ns’ constructed at the end of the First World War, many at government initiative by the Woolwich Arsenal and their three-cylinder variants, the ‘N1s’. It also describes in similar fashion the class ‘K’ River 2-6-4 tank engines, their riding problems and the decision to convert them as class ‘U’ two-cylinder moguls after the disastrous Sevenoaks derailment in 1927. The solitary ‘K1’ three-cylinder 2-6-4T was similarly converted as the prototype three-cylinder ‘U1’ with new build ‘Us’ and ‘U1s’ following in the early 1930s. The moguls, originally built by Richard Maunsell for the South Eastern & Chatham Railway, became the standard mixed traffic locomotives throughout the Southern Railway for virtually the whole of its existence and many remained until near the end of BR Southern Region’s steam stock in 1965/6. After the experience with the passenger 2-6-4 tank engines, Maunsell restricted his larger tank engine designs to freight work – the class ‘W’ for heavy cross-London interchange freight traffic and the ‘Z’0-8-0T for heavy shunting and banking work. Maunsell also redesigned some elderly LB&SCR E1 0-6-0Ts for branch line work in rural Devon and North Cornwall, providing a radial axle as 0-6-2T class E1/R. The book covers the allocation, operation and performance of these classes and includes some personal reminiscences of the author who experienced the moguls at first hand. It also covers the sale of some of the Woolwich moguls to the CIE in Ireland and the conversion of a number to 2-6-4 freight tank engines for the Metropolitan Railway. The book is lavishly illustrated with over 300 black and white and thirty colour photographs. With performance details of runs, quality images, drawings, individual histories and preservation, this is yet another excellent Pen and Sword locomotive review. This book covers the allocations, operations and performances of Maunsell Moguls and Tank Locomotive classes and includes some personal reminiscences of the author. Lavishly illustrated with over 300 black and white and 30 colour photographs, this book is highly recommended. A more than interesting work.